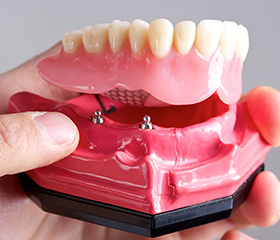 If you are already a denture wearer and can't stand another minute of dentures that slip or click, or if you are contending with the challenges of having lost most of your teeth, then restorative dentist, Dr. Bannan, offers a solution that is immediate and permanent. All-on-4 dental implants firmly secure an existing or new denture for either the upper or lower arch of teeth. Conventional dental implants require a healing period of anywhere from three to six months. With All-on-4 dental implants, however, you’ll walk out of our South Daytona dental practice with a complete smile after just one appointment. According to the American College of Prosthodontists, some 23 million adults in the United States are missing all of their teeth, a condition called edentulism. Another 12 million are edentulous in one arch. Of course, the majority of these people are elderly, and their numbers are expected to climb as baby boomers age. If you are among these millions, replacing missing teeth with All-on-4 implant retained dentures will enhance the quality of your life in many ways. First, with All-on-4 you replace all of your missing teeth with a permanent prosthodontic device that never needs to be removed. You can smile and talk with greater confidence. Dr. Bannan surgically implants four small titanium posts at strategic points along your upper or lower jaw. These implants not only hold your dentures in place, they also promote healthy new bone tissue growth, so there’s less risk of having the sunken facial features that often plague edentulous people. Your dentures will be outfitted with brackets that snap in to place along the posts. Thus, your dentures are secure and permanent, although Dr. Bannan can remove them if absolutely necessary. Secondly, edentulous people often suffer from malnutrition, because they can’t chew the foods that make up a well-balanced diet, such as fresh fruits and vegetables, proteins like meat and beans and complex carbohydrates such as hearty whole grain breads. All-on-4 restores your functional bite, so you can once again eat all the foods you need and enjoy. Finally, people with missing teeth are more susceptible to periodontal disease (gum disease), a chronic bacterial infection that can not only be the result of missing teeth, but the cause, as well. Gum disease is a bacterial infection that has been linked to systemic ailments including diabetes, pneumonia, high blood pressure and osteoporosis. With a permanent tooth replacement like All-on-4, gum disease is less likely to develop because you will need to regularly brush and floss as you would with natural teeth. This oral hygiene goes a long way in avoiding gum disease and maintaining oral health. Contact Water’s Edge Dental today to schedule an appointment for your All-on-4 dental implants. We can't wait to give you a reason to smile! Located in South Daytona, FL, we also serve the areas of Daytona Beach, Port Orange, Holly Hill, Ormond Beach, Edgewater, and beyond.